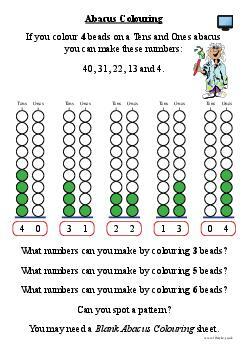 Use along with Blank Abacus Colouring (search M16.197). Place value sheets using an abacus. Using a set number of beads, it explores all the different ways to create new numbers. This worksheet is aimed at students in Year 2. It will also be appropriate for students in other Year Groups, of a similar ability level. It covers the topic Number - number and place value.